“If you were to come and ask me for a tinnie of marijuana and I give you a tinnie of lawn clippings, you’ve still committed an offence, even though you haven’t got drugs in your possession.” Sound reasonable? Perfectly reasonable according to Senior Sergeant Rupert Friend of the Hamilton Police. In the odd case of Betty Tamihana, who tried to purchase some cannabis on Facebook to treat an anxiety disorder, she found that if you try to buy some medicine and get ripped off, the New Zealand Police will not help you if that medicine was cannabis. In fact, they will attack you. Such an attitude is especially galling for the tens of thousands of Kiwis who use medicinal cannabis. Imagine being told that not only is your medicine illegal but if you so much as get ripped off by someone falsely claiming to sell you it then you are a criminal. If your light is on at night because you can’t sleep, perhaps that could be taken as sufficient evidence that you might end up wanting to buy some cannabis to cure the insomnia, and so the Police should have the right to pre-emptively break into your house and put you in a cage (for your own safety of course). Joking aside, that shows how ridiculous cannabis prohibition is. 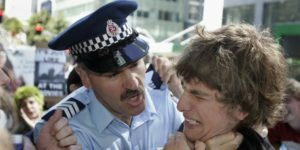 Should we accept that, in New Zealand, after all the time and effort we’ve put into building a decent justice system, a Police officer might sell the sufferer of a mental illness some grass clippings in the guise of an anxiety medicine just to arrest them under a law that was supposedly enacted to protect the public? None of this is to blame the Police. The Police are men of iron, and the key to understanding them is to understand dogs, who are also of iron. The thing about dogs is that they have absolutely no concept of right or wrong – they just obey dominant males in their group. Anyone who feeds them, or pays them in the case of Police officers, is their total and complete master, and they will rip to pieces anyone who fails to pay this master due respect. The real bad guys of this story are, as usual, the Paedophiles of Wellington, who are the ones responsible for maintaining the law against cannabis freedom that is mindlessly enforced by the Blue Dogs. The refusal of the New Zealand political class to accede to the public will to repeal cannabis prohibition has driven a wedge between the Police and the public, as it has induced the Police to spend forty years attacking the citizenry in the War on Drugs, instead of acting as peace officers, which is their warrant. This has meant that there are now several large demographic groups – the under 40s, Maori, the mentally infirm – who distrust the Police to the point of seeing them as no less oppressive than an enemy army. Of course, the biggest irony of this story is that the only person to behave in a rational manner was the drug user who called the Police to report a fraud. The Police officer did not act rationally, because to have a total lack of sympathy for the sufferer of a mental condition is the kind of hatred that ends up getting reciprocated, even if indirectly. Blown me away perfect unforgiving scenario. Love how you can put things so simply. Much appreciated. Health and Happiness. 4 standing on the sidewalk & repeating “2, 4, 6, 8 pls don’t discriminate”, I was charged with “disorderly behaviour”. Police then bribed me to lie & “admit your guilty”, saying “give $300 to charity & we’ll 4get the whole thing”. Cheaper than $2k+ for a lawyer & the lawyer tells me, “60+ % chance I can get u off but it depends on who the judge is, his mood on the day, and who says what and how”. Proving that it is a legal system not a justice system and that the outcome is subjective not objective. The police know how to play the game, I don’t, so I give them $300 and pay $300 less in tax. Result- $300 moves from 1 govt dept to another. I still resent the discriminator I was protesting against and now resent police and the legal system as well. My request for restorative justice was illegally ignored and police present a “summary of facts” which is in fact a summary of alleged facts and only those “facts” which police have edited in order to get a successful prosecution. After all, police are not in the justice business, their in the prosecutions business, so will distort “facts” so as not to get egg on their face or b seen wasting taxpayer $. They certainly arnt going to present any facts like that I was at all times orderly and non violent. Hence my attitude the ONLY good cop is a dead cop. Police charge drunks with disorderly behaviour but the criminal drug dealers behind the bar continuously go unprosecuted. It is illegal to serve intoxicated persons. police turn a blind eye. Previous Previous post: They Refuse Us – We Refuse Them!